Oh my goodness! 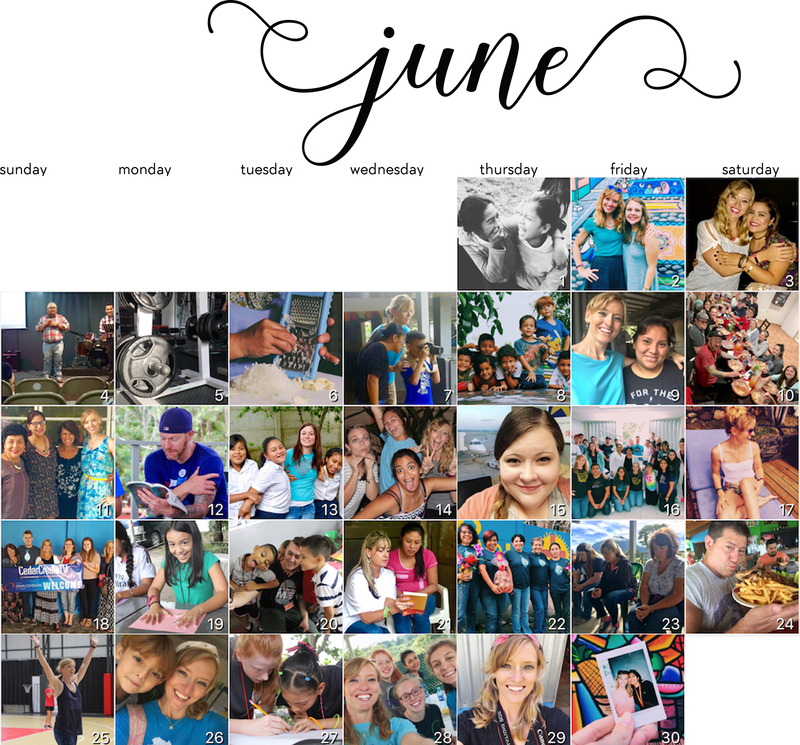 June was such a whirlwind! Our church, Iglesia Gran Comisión, hosted THREE mission teams in a row this month! It was super fun but also super exhausting! The teams started with a team from Rock City, led by Nate Eckhart, so that was a wonderful taste of home! Sylvia, one of my friends and a missionary on the team, even took time to give me a haircut! Thanks girl! Because this month was so crazy busy with mission teams, I decided to do something a little different and update you with a Photo-a-Day series! And there you have it! A month in photos! Our A-Team (Ashley + Ali + Adri) has added an M to the Team – MORIAH! We have become an amazing, beautiful, well-oiled machine when it comes to mission teams! Which is great because we have SIX more teams this year! It is definitely a lot of work, but I truly love spending time with mission teams. Not only are they a breath of fresh air from the States, but what I love most of all is showing people just why I love it so much here. El Salvador isn’t just the violence you see on the news. El Salvador is a country literally filled to the borders with people ready and waiting with open arms to offer you an afternoon coffee, pan dulce (pastry), and spend hours talking about life. I love it when people see the spark of a brighter future for this country in the eyes of the children we serve in our Centers. And I absolutely love it when people to commit to helping be a part of the change here in El Salvador. I don’t have solid dates yet, but I have talked with Reliant and Pastor Victor and it is looking pretty certain that I will be home for the months of October and November this year! I am so excited to connect with each of you! As soon as I have more solid plans, I will let you know! If you’ve gotten anything at all out of following Christ, if his love has made any difference in your life, if being in a community of the Spirit means anything to you, if you have a heart, if you care— then do me a favor: Agree with each other, love each other, be deep-spirited friends. Don’t push your way to the front; don’t sweet-talk your way to the top. Put yourself aside, and help others get ahead. Don’t be obsessed with getting your own advantage. Selflessness is an area where I am continuously learning to grow. I was raised by amazing parents who were themselves incredibly selfless and consistently put my every need before their own. But what this led to then was an adult woman who isn’t always so good at putting others first. How’s that for vulnerability in a simple monthly update?? Whereas many people are naturally gifted at seeing needs before they are noticed by anyone else – and then meeting those needs – I must keep my eyes actively peeled for how I can help, especially when I am serving mission teams. What about you? In what ways is God growing you this month? How can I pray for you in this growing season? Remember – this life is a constant journey with God of growing and refining who we are. We are forever beautiful works in progress! It has been awhile since I’ve gotten any mail! Stay in touch! It will require a bit of flexibility due to our crazy mission team schedule, but I would love to videochat with you! Send me a message and let’s plan something! For ENERGY! Even this girl gets drained after being with mission teams 12+ hours day, 7 days a week! That working with mission teams would not become routine and commonplace. I am praying that I can see God moving in and through each of our teams. For the English Academy! It is in the solid planning phase! We are talking with nearby schools to gauge their interest in partnering with us and beginning to plan lessons and work out the logistics! GREAT NEWS! Thanks to the giving heart of one of our missionaries, we now have enough money to begin our Academy and get it off the ground and running! Plans for my first trip home since moving here 14 months ago! There are many details to iron out and I am working on trusting that God already has everything figured out! That we can finally finish funding equipping our Dental Clinic at the Volcano. We now have one dental station but are aiming to get a second so that we can serve not only the children in our program, but the community and the children of Soyapango as well! We have $7000 left to raise! These are some of my besties at our Development Center in Soyapango! May was a wonderfully HOT and rainy month here in San Salvador! Fortunately, the rain doesn’t last long and many times is during the night, so it makes sleeping just lovely! We didn’t have any teams this month, so it was a wonderful opportunity to rest up and gear up for the NINE more teams we have coming this summer! My Five Favorite May Moments! 1. Mother’s Day – Mother’s Day is June 10th here in El Salvador. I got to have breakfast with Silvia (Pastor Victor’s wife) and the family! We went to a local restaurant and had unending cups of coffee, pancakes, eggs, bacon – I think we had a little bit of everything! And once I was so stuffed I couldn’t eat anymore, I got invited to lunch with another family from church! We ate burgers and fries until we just couldn’t fit anymore – and then we went for an afternoon coffee and we just had to have sweet treats with our coffee! 2. Adri’s Graduation! – After years of hard work, my friend and coworker Adriana graduated from college with a degree in Industrial Engineering (smartypants 🤓) She asked me to take photos of her family graduation lunch and as a perk, I got to enjoy the lunch as well! Currently, Adri is our church’s Mission Team Coordinator, so we are all praying for wisdom on where God takes her next! 3. English Classes – My fellow missionary Ali spent a few weeks in the States to be with her family as her sister just had a baby! Ali teaches the English classes at our Volcano Development Center, so while she was gone, I became her substitute teacher! To be honest, I was kinda nervous about going back to teaching, even if it was only twice a week for three weeks. But as He usually does when I am fearful about something, God proved me wrong and I really enjoyed myself! The kids were really well behaved and I loved focusing in on the ones who really have a desire to learn English. 4. Photo Project – As a project for mission teams, Ali and I are working together to take photos of every child at both Centers and create a wall of photos! This will help missionaries not only learn the kids’ names, but it will also be a great way for them to know which ones need sponsors, and they will hopefully be encouraged to sponsor one of our children! I have always loved photography, and this was a fun way for me to learn more of the children’s names myself and build friendships with them! 5. PIRATES – Anyone who knows me should know about my affinity for Johnny Depp. The 5th (and last?! 😩) Pirates of the Caribbean movie came out last weekend and not only did I see it once, but I saw it TWICE! And not only did I see it twice, but I saw it in Spanish AND in English! I am fairly biased, so I’m not sure I am the best reviewer, but I thought it was awesome and the man who does “Spanish Jack Sparrow” does a spot-on imitation! Contentment is hard to come by, it’s not a guest that arrives naturally or stays willingly. Contentment is an enduring peace that is independent of circumstance. The secret is this: nothing on this earth will ever satisfy me like being with Jesus. Not a different stage of life, a bigger salary, fewer responsibilities, or losing my love handles. Until I treasure Christ as my only true need, my only worthy pursuit, my only fulfilling hope, my soul will remain unsettled. Until I see every disappointment, disease, and difficulty I face as yet another chance to prove the worth of Christ, I will be disgruntled…unwavering peace comes only in the presence of the One who will never leave me or forsake me. Friends – what adjustments can we make in our lives this week to move towards contentment? Please stay in touch! There are a number of ways to contact me! I’ve actually had some sort of stomach bug for the past week! I finally got some serious meds last night and I am praying for a quick and thorough healing! For Moriah Harris! Moriah is from Iowa and way back in June 2015, she and I went to our Reliant training together in Orlando! All in his timing, Moriah is finally moving to San Salvador in two weeks on June 15th! Please pray for an easy transition! She will be living with Ali and I and the Turcios family, so it will be wonderful to have another “gringa” here with us! For energy during Mission Team Season! Working with teams is one of my favorite parts of my job, but our days go from 7am-8/9pm everyday, with no days off when we have back to back teams! Adri, Ali and I will need some serious energy and perseverance! For the tenacity to go after this English Academy with everything I have! I truly believe in its necessity, I just need to believe in God’s ability to do great things through me! This is Elote (el-oh-tay)! It’s grilled corn on the cob on a stick covered in butter, mayonnaise, ketchup and salsa negra (“What’s salsa negra? “It’s black sauce.” “CLEARLY. But what’s in it?” “I dunno” hahaha!) Elote is super delicious and now that I’m describing it to you I’ve given myself a craving for it! Ha! HOLY CRAP IT’S HAPPENING! You’re on the plane, headed to a new life in San Salvador! This is IT! This is what we’ve been working and praying and crying and thinking about for almost 2 years now! And here it is! IT’S HAPPENING! Okay woman, calm down. I’m you 365 days from now. It’s April 21st, 2017. You’ve lived here in San Salvador for a year now and it’s been a heck of a year. I know you’re all “LIFE IS AMAZING – EVERYTHING WILL BE WONDERFUL – LET’S GOOOOOOO!” and that’s great and you’re right, but I am here to give you a head’s up about a few things. First of all – Spanish. Santo Dios, Spanish. This is going to be your greatest challenge this year. As it turns out, you’re not going to learn Spanish through osmosis. Immersion is a thing and it certainly does help, but you’re going to have to put in some serious effort. And you’re going to want to quit approximately 7 times a day. But woman, you live in San Salvador now! They speak Spanish! So DON’T QUIT! But guess what – you’re going quit. Like 17 times this year. You’re going to hit a plateau of ability, get frustrated that it’s not coming easier and you’re just going to stop trying to learn anymore. It’s ok. Spanish is hard. But quit quitting! Your mama didn’t raise no quitter AND she told you like 18 years ago that you should learn Spanish (and you chose French 🙄). So remember who you are and why you need to learn Spanish (y’know- so you can love people in their own language!) and JUST DO IT! Second thing – relationships. You are going to strengthen the friendships you already had here and you are going to be able to make new ones with some pretty amazing people. Salvadorans are a beautiful, loving, kind people who will pretty much do whatever they can to help you when you need it. Ash, we have always been good at loving people. It will be a little more difficult to love people the way you are used to due to language barriers and culture differences (for example, I think Lelys thinks we’re hilarious simply because she doesn’t understand our Spanglish 85% of the time! ), but you will learn to love people in ways you never have before. Enjoy that! Third and last thing – God. Your relationship with God is going to be chaotic. At times it will be passionate. You will see God working in everything and everyone. You will find God in the unrelenting grasp of a child’s hug, in the sound of hundreds of Latino youths worshipping Him, and you will definitely find God in the taste of Easter Torrejas! But I’m going to warn you – those are going to be rare times. Most of the time, you are going to question if God even knows where you are, if He’s doing anything in your life and why He’s not speaking to you. Ash, this is normal. It’s not fun, but it’s normal. The truth is, God knows exactly where you are every moment of every day. He is using every success and every failure for your good. And He is always speaking to you. You must learn to listen! These are only dips – they will not last forever. Keep searching for Him. Keep your eyes peeled and He will show you His presence. Moving to another country! Some people never leave the city they were born in! But you?! Florida? Nope. California? Nope. Colorado? Nah. EL SALVADOR? Why the heck not?! With your help, a beautiful Dental Clinic at the Children’s Center will be constructed so that the people of the Volcano can live longer, healthier lives. Inspiring short-term missionaries to dedicate their lives to serving God in their own country. This one you aren’t going to be verbally assured of very often, so you just need to know it in your soul – God is using you to inspire people. Through you, God is demolishing the fears people have about completely surrendering their lives to Him. They will see you and God will instill a sense of “Hey if she can do it, I can do it!” in their spirits. Loving people! Ash, the truth is, there aren’t going to be a whole lot of “LOOK WHAT I DID!” moments this year. This is a year of learning and adjusting. But oh my goodness, you will love people as much as you possibly can. And they will love you back! That’s the best part! So soak up all those little kid hugs, say yes every time someone invites you to coffee and thank God that love really does transcend spoken language. This year was pretty great, Ash. WE DID IT! You persevered through what I am pretty sure will be one of the greatest challenges of your life – adjusting to a new country with its culture and language, a new job, new home (living with your boss/pastor and his family! ), new everything. I’m not sure what this new year will bring, but I have a hunch that it’s going to be even greater than this year. Keep up with the Spanish and you’ll be able to serve more, connect more and love even more than before. And above all, let go. Sure, God’s driving the car, but sometimes you seem to think you still have the map! Sweetheart, move to the backseat, roll down the window and enjoy the ride. God is good and He is good to you. The day I moved to San Salvador, I posted a photo and wrote a caption that remains true 365 days later – I may be God’s hands and feet, but you are His heart. And as always – please stay in touch! I have received a number of cards and care packages this year and each one brings such genuine joy to my heart! For the next 365 days! Only God knows what they will bring, but please pray that I would be obedient to His will and open to hear His voice. For José Valle, a brother in our church and my dear friends Meli and Florence Valle’s father. He was hospitalized last week for an infection in his leg and respiratory issues. He seems to have stabilized. Please pray for a miraculous healing and peace for his wife and daughters. 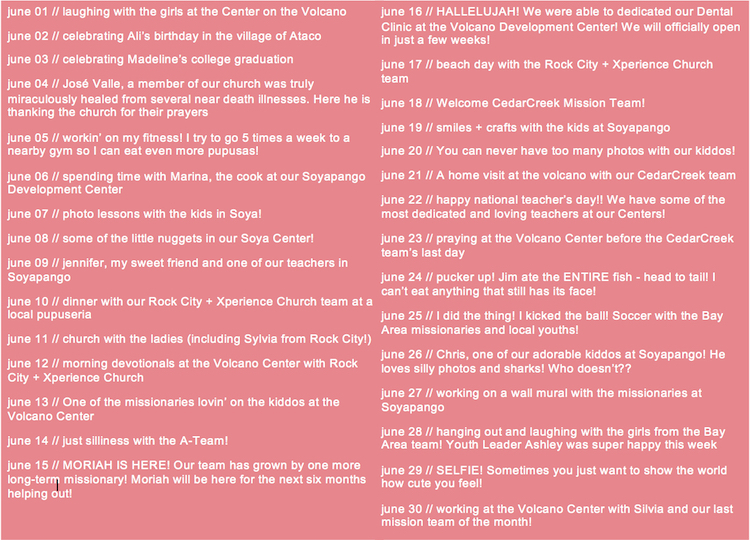 For ongoing fundraising for our Dental Clinic at our Volcano Children’s Development Center. In 2016, we were blessed to be able to raise $40,000 to build the clinic above our current Total Health Clinic. Now, we need $18,000 more to purchase dental equipment. The need for dental care, hygiene and education is great at the Volcano. Is my social media being used to bless others with encouragement and love or am I really just boasting on myself and feeding others’ unhealthy comparisons to me? Well isn’t that a heck of a question?! Over the past month or so, I have been churning through Lysa TerKeurst’s (I can never spell her name without looking!) book, Uninvited. This book piqued my interest because I came to El Salvador with the expectation of former friendships made here to immediately grow and for everyone to become my bestie, available 24/7…and that didn’t exactly happen. My friends had lives they were living that needed tending to. 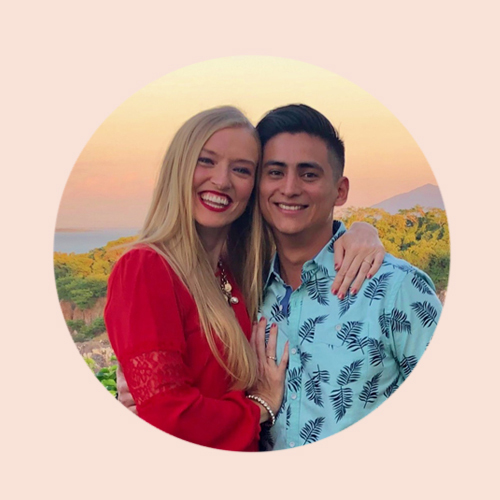 They are college students, professionals, missionaries…they have job titles other than Ashley’s Friend. Add that unrealistic expectation to the feeling of being an outcast when in groups because I couldn’t understand what everyone was saying (#spanish), and pretty quickly I began feeling left out and lonely. And that is exactly what Lysa’s book speaks to – “Living loved when you feel less than, left out and lonely.” As you can imagine, I’ve underlined basically every word of this book. This particular chapter talks about how the devil uses our feelings of left out-ness and not good enough-ness to tear us down and attack us at our weakest. I have been both the victim of comparing myself to someone else’s perfect Instagram feed and the culprit, trying to make my life look lovely and shiny and full of beautiful, God-fearing unicorns (yes, my vision of a perfect life includes unicorns). And there have been times when I am both the victim and the culprit simultaneously. With one post, I am desperate for affirmation from friends and strangers and possibly causing those same friends and strangers to fall into the trap of comparison. There is nothing we can do to control what others post. But what we can control is our intentions and how we react to others’ posts. What is my intention for going to social media? Am I bored? Looking for inspiration? Wondering what my friends back home are up to? Or am I looking for proof that someone else’s life is just as sucky as mine in that moment and desiring affirmation for my sucky feelings? If I can identify in the moment why I am mindlessly scrolling through Instagram, I may be able to save myself a good amount of emotional stress. If I am looking for affirmation of my negative emotions, perhaps the better thing to scroll though is my Bible. That book is full of people who have felt rejected and left out. David for example – his own father didn’t even think he was good enough to be considered for king. Our parents are supposed to see and proclaim our wonderful abilities and qualities, but all David’s father saw was a scrawny shepherd. Yikes. Parental rejection is the worst. Of course, there are many, many encouraging posts on Instagram that can help us learn to look to God in the tough times, become better prayer warriors, get closer to God….the list goes on of the amazing posts I have seen and leaned on in times of weakness. But before turning to the bloggers, I should turn to the Great Writer. And then there are the times when I am truly just bored, scrolling through, looking at pretty pictures of flowers and adorable puppies and being inspired by insightful Christian bloggers and BAM! Yet another person engaged, who, really, I never in a million years thought would have a boyfriend, let alone get engaged before me! Really God?!? Like, do you even know what you’re doing up there?? I’m 32! THIRTY-FREAKING-TWO! I should be married, have 2 kids and know how to make the perfect pupusas and delcious browies all in the same hour! But NOOOOOOO….!! WAHHHHH! This, dear friends, is the perfect (and oh-so-real) example of an unhealthy response to a friend’s happiness. And this can be controlled by choosing to flood my spirit with God’s truths. Immediately, the lies of not good enough-ness and never going to happen for me-ness flee in the presence of God’s truth. The truth that God DOES love me. God DOES care about me. And above all, God DOES have a plan for this life He created. So friends, let’s be careful about what we post on social media. Let’s ask ourselves if we are hoping to encourage others or show off how immaculate our lives are. Because let’s be real – life is messy and it helps to know we aren’t alone in our mess.